A new study proposes that applying a small electrical current to selected areas of the brain can increase its activity and thereby make learning easier. Prof Heidi Johansen-Berg of the University of Oxford presented their findings at the British Science Festival in Bradford. To observe this effect, the team has devised an experiment, whereby volunteers must memorise a sequence of buttons to press "like playing a tune on a piano". While they are doing this, they are fitted with a "trans-cranial current stimulation" device, where two rubber electrodes are places in a specific position on the head. A very small, one milliamp current is passed between the electrodes in an arc through the brain and, depending on the direction of that current, will either increase or decrease the activity of that part of the brain. Professor Johansen-Berg explained that "an increase in activity of the brain cells makes them more susceptible to the kinds of changes that occur during learning". The results of the button-pressing experiments showed the positive effects of just 10 minutes of the brain stimulation on learning, compared to a very similar placebo set up. "While the stimulation didn't improve the participant's best performance, the speed at which they reached their best was significantly increased", said Professor Johansen-Berg. Science fiction authors have long enjoyed stimulating their readers with this same idea. In his 1938 story Easy Money, sf legend Edmond Hamilton described a control helmet that speeded up the process by which individuals formed a more coherent society. In his 1957 novel Cities in Flight, James Blish described an accelerated schooling helmet, which he described as a "bright metal helmet which had inside it what seemed to be hundreds of tiny, extremely sharp points". SF television shows of course couldn't resist the idea of a learning helmet. 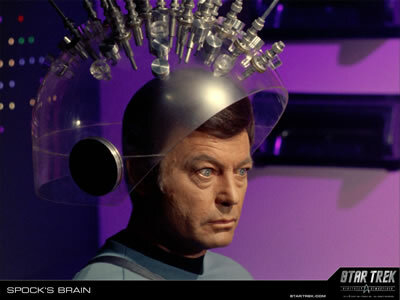 In the classic Star Trek episode Spock's Brain, Dr. McCoy gains centuries of medical knowledge in a single episode (now that's accelerated learning! ).